tr. from French by Karen Li. illus. by Véronique Joffre. 32p. Owlkids. Mar. 2019. Tr $17.95. ISBN 9781771473651. PreS-Gr 1—An outdoors jaunt in the vein of Blueberries for Sal. A boy and his mother are car camping in the woods. Once their tent is set up, the two enjoy nature. The boy is scared to jump into the lake. Meanwhile, a bear cub is afraid to jump into a campground dumpster to rummage for food. They both make the leap. When the boy takes trash to the dumpster, the anxious mama bear is there to help her cub who is stuck in the dumpster. The campers devise a plan to stick a log into the dumpster for the cub to crawl out. The plan works. The premise throughout the book is that both sets of mother and child push past their fear and succeed at the task at hand. The artistry of Joffre's cut and painted paper collage illustrations gives the book some distinction. Textures, bright colors, details, and creative attention to perspective provide readers something interesting to see with every turn of the page. The prose, while very spare, can read as an unnecessary addition. 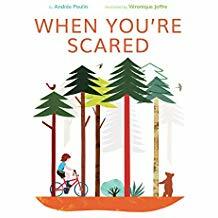 VERDICT Relevant issues, such as emotional resilience, good stewardship, and challenging oneself, together with the thoughtful illustrations, make this a worthy purchase for libraries.